“It’s not as if she was just on drugs this year. In the last two years previous she has been European outdoor [100m hurdles] champion twice, fifth in the [London] Olympics and she won indoors this year." “I don’t think the punishment really fits. I doubt she will have to pay back the money she has earned and I can’t see her writing me a cheque for all my lost earnings. ... She failed the test on February 8 so I don’t know why she was even allowed run. [The women’s European 60m hurdles was March 1.] I only missed out on a medal by one-hundredth of a second and she was in the lane between me and the other two girls. She shouldn’t have been in the equation." - Irish sprint hurdler Derval O’Rourke (who will be upgraded to European indoor bronze after Turkey's Nevin Yanit got a 2-year ban), talking about how when it come to doping, the punishment doesn't fit the crime. Assuming Yanit has been doping since the start, she's enjoyed years of success and financial gain and now the only punishment she faces is a 2-year time-out. Hopefully this will change with stricter doping rules in 2015. 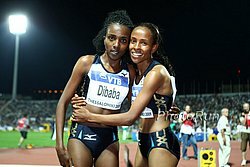 Zurich 5,000m - Defar or Dibaba, who wins? HEJNOVÁ: "I am irritated that football and tennis players earn so much money in comparison with us!" Folks in my city are starting a coalition pushing for a $3 increase in minimum wage in two years. Good or bad? Joining a fraternity and being a college runner? Are there any low mileage college teams these days??? LRC An Incredible Women's 5,000m: Dibaba Vs. Defar For $50,000 (And Simpson Vs. Huddle For AR) The matchup track and field fans have been waiting for all year is actually going to take place Thursday in Zürich: World 5,000m champion Meseret Defar vs. Tirunesh Dibaba. In 2006, Defar upset Dibaba and cost her $125,000. This year the $40,000 DL event bonus is on the line. Also in the race is American World Champ silver medallist Jenny Simpson and American record holder Molly Huddle. Will Huddle's AR go down?